Are your plants suffering due to drought? We can offer advice through our Drought Consultation Services. This plant is a must for ponds and bogs. The arrow-shaped leaves are 4-8 inches wide and up to a foot long. Stalks upwards of 3 feet tall appear in late spring topped with 6-8 inch spires of violet-blue flowers. A white cultivar is also available. Blooming often lasts into the fall. If planted directly into the soil, pickerel weed will spread by rhizomes to form a thick stand from the pond's edge out to where the water is 6-12 inches deep. This provides good cover for wildlife. Pickerel weed can be container grown in aquatic soil to prevent spreading. Divide plants in the early spring as needed. 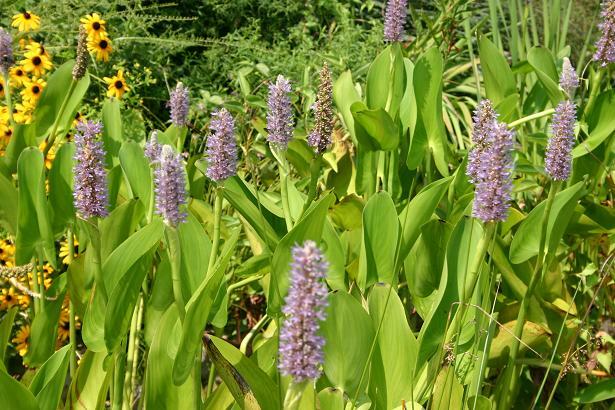 Use pickerel weed in home ponds or bogs that are in full sun. Pickerel weed can also be used in fresh water ponds and lakes for restoration projects. The plants must be growing in soil that is constantly wet or submerged in shallow water. Good companion plants include water lilies, Louisiana iris and common rush (Juncus effusus).